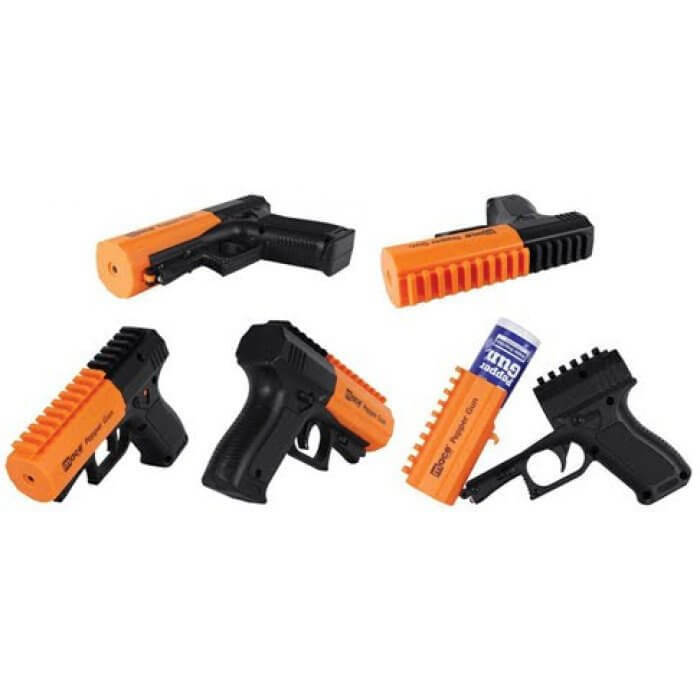 Over the past few years, Mace has created a line of pepper guns that excel in accuracy, dependability, and compact design. However, the nature of pepper spray is such that many people have asked for less potent alternative before being forced to use the spray. 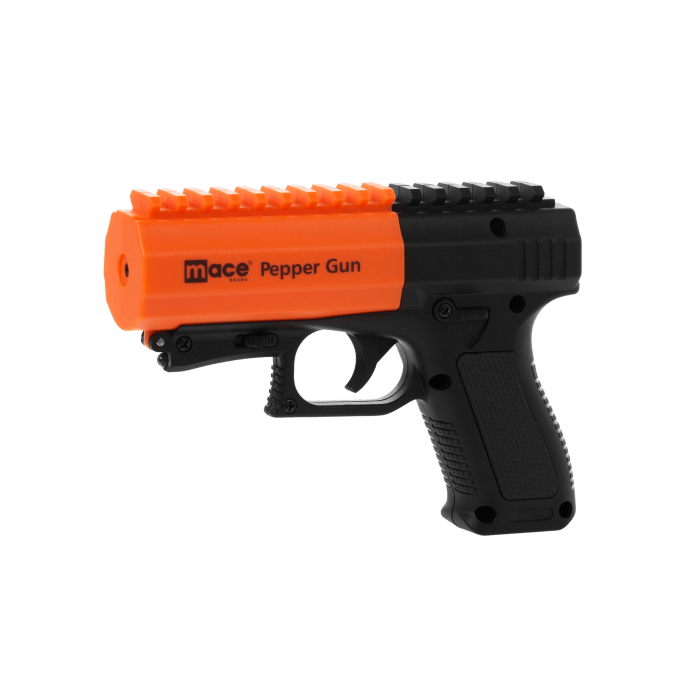 Over the past few years, Mace has created a line of pepper guns that excel in accuracy, dependability, and compact design. However, the nature of pepper spray is such that many people have asked for less potent alternative before being forced to use the spray. The concern comes from accidentally using the spray against someone who does not present a danger or wanting an additional method to disorient a potential attacker. The Mace Pepper Gun 2.0 with Strobe LED offers two forms of disorientation just like the original designed to buy you enough time to leave the area while thwarting a potential attack. Although shaped like a pistol, the bright orange color indicates clearly that it is not a firearm. The gun breaks open much like a shotgun to allow for the loading of new pepper spray cartridges. The Strobe LED emanates from the front of the pistol. Pull the trigger the first time and the strobe LED is activated, disorienting the attacker and providing a target for pepper spray which will fire on the second pull of the trigger. The pepper spray will cause their eyes to close, a burning sensation on the skin, and coughing to stop an attacker cold. The effects will start to wear off after 45 minutes. There are several advantages associated with this product, starting with its relatively low cost. This means that you get ample protection for a small price that is legal to carry without permit in most states. Compact: The small nature of the pepper spray makes it easy to carry in your purse, pocket, or attached to your belt. This means that it can be pulled quickly so you can use it even when surprised. Accurate: The pistol-shape of the pepper spray device makes it extremely accurate for the Strobe LED and the spray to hit the target. Aim for the face or upper chest and fire the LED first, followed by the spray and then get out. Effective: The strobe alone is enough to delay an assault while the pepper spray will stop them for upwards of 45 minutes, allowing you enough time to get away and call for help. The Picatinny rail lets you attach a laser pointer, small LED light or other attachment for even greater accuracy. 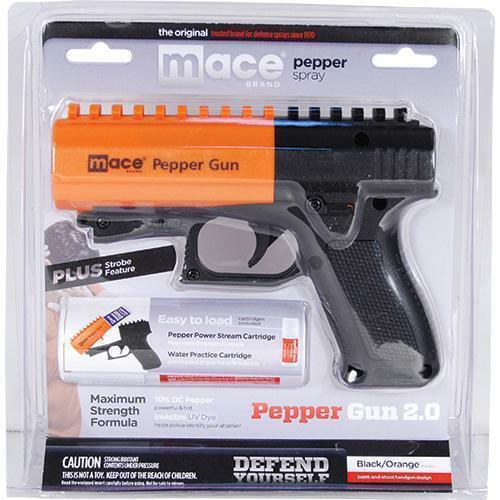 There is little doubt that the Mace Pepper Gun 2.0 with Strobe LED is an effective, compact, and powerful deterrent against assault. The Strobe LED offers an excellent first warning and paints a target for the pepper spray. There is even a water cartridge you can use for practice, making this one of the best products of its type on the market today. It should be noted that residents of Massachusetts, New York, and Washington D.C. are not allowed to have this item shipped directly to them. However, they can purchase the device from a locally authorized reseller who follows all state requirements.